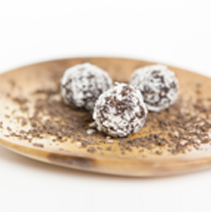 These beautiful truffles are an energizing delight! The richness of our organic maple syrup shines through the coconut flakes to provide the perfect nutritious goodness to satisfy any sweet tooth plus provide a nice boost of energy. One of our best sellers – as our customers say they can eat many of them and keep feeling energized with none of the crash! Be sure and stock up as you won’t be able to resist the love added into each batch of these amazing treats! Ingredients: Coconut flakes, cacao powder, maple syrup, coconut butter, vanilla extract, sea salt.